Aside from being a fan and player of video games, I enjoy the world’s of DC Comics and Marvel as well. I never got too much into comic books, though I did own a few when I was younger. I just saw it as a lot to get into and money I didn’t have to start growing a collection. I do watch the live-action and animated movies, as well as catch up on characters I don’t know of on Wikipedia. Batman has been one of my favorite characters out of all of them. He doesn’t have powers, is not afraid to get rough with his enemies and always has a plan, even before anything happens. 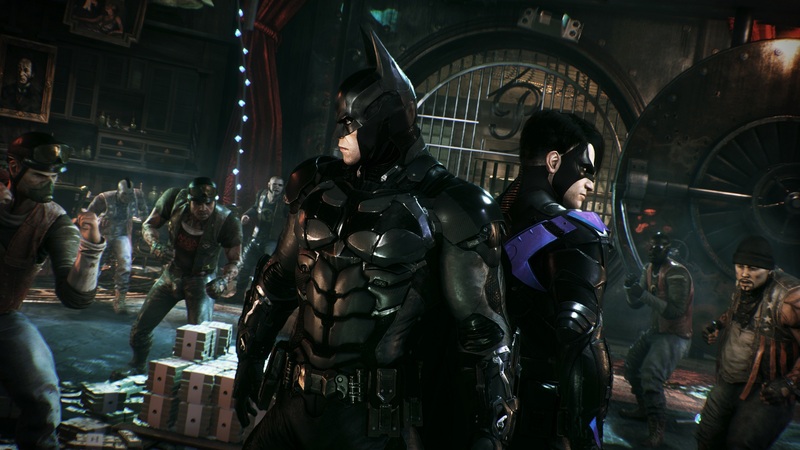 While playing Arkham Knight, I noticed another quality of his that I overlooked and haven’t heard anyone touch upon. Batman is someone who fights against extreme darkness, psychopathic villains, criminals, and doesn’t get much appreciation for it all. On top of that, he’s hunted by the police and more than once his own teammates that he himself trained got killed or badly injured (Robin was killed and Batgirl ended up in a wheelchair). 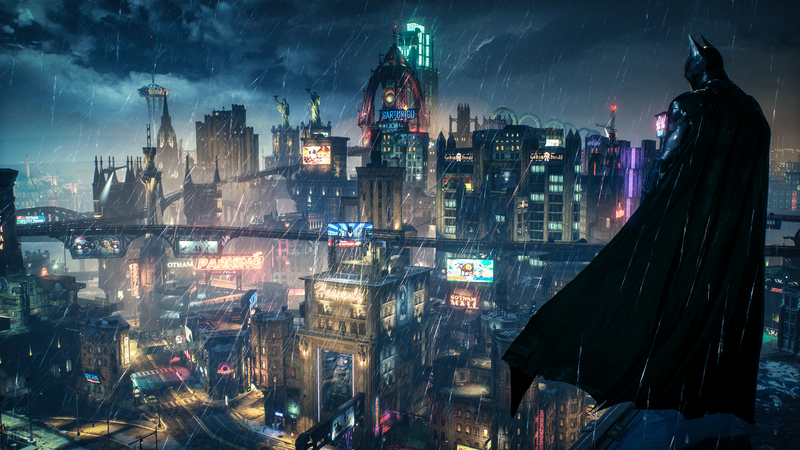 Batman is one of the few, if not only, lights that shine in Gotham. He has to get down and dirty on the streets and beat up thugs, rescue officers that were kidnapped, stop mercenaries, and bring in people like Croc, Penguin, and Two-Face. All the while, not give in to the madness of the world around him or the proposals his adversaries give him so he will throw in the cowl. At the beginning of the game, you even see Batman encounter hallucinations of the Joker, who had died and been cremated. The voice of his arch-nemesis taunts him to give in to madness and even kill himself. It was pretty nuts from my perspective, as I’ve never seen a game do that. It also was interesting how he never responds to it and continues doing what needs to be done. That couldn’t have been easy. As a Christian, many times I am put in situations where I am the only one that knows the Truth, Jesus Christ. I am around people who don’t care about God, have completely opposite values and defend them strongly. Our “kind” isn’t wanted, because I am considered “religious” or a “fanatic” and just stinking up the air. That’s alright because the world doesn’t accept the Good News easily, they are blind to it. Batman isn’t accepted in Gotham no matter how much good he does. He is still seen as a vigilante, someone that doesn’t follow the rules. Instead of calling the police, he takes matters into his own hands. He will tie up the goons to a light pole or hang them over a fire escape and leave. He should call the authorities at least to let them know, or sign a statement of what happened, instead he glides away into the night. Living in this world can be difficult as a believer in Christ. All around us, the message is to do what we want, how we want, and when we want to. Forget about your personal morals or objections! If you have any, then you are just being a chicken or not “cool enough” to hang out with the “popular people”. When those same popular people are the ones getting drunk, smoking, sleeping around, having a foul mouth, gossiping and doing whatever feels good. Many times, they don’t even care about God, His will for their lives, or anything related to leading a decent life. I refuse to allow people with opposite values shape who I am. If I get ridiculed, then that’s OK. I’m thankful that’s all I will likely get, as Christians in other countries encounter real persecution and are martyred for their faith. Getting a bad comment on social media, or losing a friend or family member is just a normal part of being a follower of Christ. Jesus Himself said that those who forsake their family, wife, brother, sister, etc. will inherit eternal life and receive one hundred fold in this life (Mark 10:29-30). He promises to bless us with 100x more for those we have to leave behind for the gospel of Christ. It’s not easy, I know because I’ve had to do it myself with several family members and friends. Be encouraged, because no matter the place you are in, God’s light is pouring out of you for others to see. Darkness has to leave when light shows up, even if it doesn’t like it. I pray that you and I can be examples of who Christ is, everywhere we go. Sometimes you won’t get any appreciation for it, instead, you get backlash, but know that His will is being done. Be obedient to His voice, and He won’t fail you. I like your article. Batman story and values can be seen from various perspectives and applied to different situations. Because of his background, he has always been my favorite superhero. He is a hero who is pushed to the limit, thrown into the madness and expected to survive. He always focus on what is important and try no to let his foes change him. Although he is forced to question his morals and methods, he always remains strong. But he is also conscious that some things cannot be done without getting your hands dirty, some decisions will have consequences and will put a great burden on you. For this reasons, I consider Batman as one of the best characters made in history. He decides to take action, even when he doesn’t have to, and he decides to held himself responsable for the people. He is strong for those who can’t. There is lot to learn and a lot of positive things to take from the Batman.